Author Miriam Horn describes how a Kansas farmer works for his soil to keep it working for him. The following is an excerpt from Rancher, Farmer, Fisherman: Conservation Heroes of the American Heartland, by Miriam Horn. A first lesson Kansas farmer Justin Knopf learned from the prairie is the importance of physical protection: keeping a roof of living and dead plants over the soil and its inhabitants. Walking into the tall, stout, crunchy stubble of a cornfield, Justin lifts an edge of the thick, dense carpet of “residues” he left behind when he harvested here a few weeks earlier: a tatami mat of yellowing leaves, stripped cobs and year-old wheat straw. “If we have heavy rain, that raindrop is going to land on this residue instead of on bare soil. It could blow or rain like mad and nothing will leave this field.” The mat also protects everything living in the field, beginning with the crop itself. Justin doesn’t grow much corn, which pollinates and needs lots of water and cool temperatures in just those months when Kansas is blistering under the hot sun. But when he does, having this “natural mulch of wheat residue between rows really helps reduce evaporation and cool the soils.” It also suppresses weeds, giving the crop a head start. Above ground, the stubble provides shelter for grassland birds, a highly vulnerable group in fast decline as ever more of their habitat is converted to farms. Justin often hears the low, fussy clucking of ring-necked pheasants in his fields, startles up a family of bobbling quail, or pauses to watch a coyote skulk about in search of fledglings or eggs. In Illinois, researchers have found that no-till fields host significantly more and diverse nesting birds, including threatened upland sandpipers, Eastern meadowlarks and field sparrows. Leaving the dead remnants of the previous crop atop the soil also protects the life underground, not only keeping the microbial hordes cool and moist but also—the second lesson of the prairie—feeding them at a more temperate pace. “See how everything is gradually crumpling as the fungi eat it,” asks Justin, “from the bottom up? We’ll find pieces of milo stalk three years later. My grandfather was taught that by plowing under the residue they were feeding it back to the soil. They didn’t realize the soil could feed it back to itself, at a slower pace that’s much better for the soil.” Turned under, Kansas State soil microbiologist Dr. Rice explains, all that leftover plant material overstimulates the microbes, “like giving sugar to a kid.” Fast-growing bacteria explode, eating their way through the organic material and exhaling much of it into the air. A slow-food diet, by contrast, nurtures more efficient fungi that store most of what they eat in their own growing bodies, keeping it there (and thus in the soil) even after they die. Their long, weblike hyphae also perform services for Justin’s crops: bringing the plants nutrients they can’t reach on their own and binding the soil in the big, soft lumps roots love. 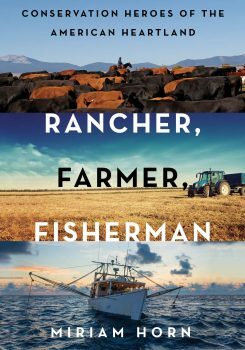 Excerpted from Rancher, Farmer, Fisherman: Conservation Heroes of the American Heartland by Miriam Horn. Copyright © 2016 by Miriam Horn. Used with permission of the publisher, W.W. Norton & Company, Inc. All rights reserved. Miriam Horn is a writer at the Environmental Defense Fund. She’s also author of Rancher, Farmer, Fisherman: Conservation Heroes of the American Heartland (W. W. Norton & Company, 2016). She’s based in New York, New York.